When Pam Amabile entered Erie Community College in the late 70’s fresh out of Frontier High School, few if any would have considered her a pioneer. Legacies, however, are made over time and now, some 35 years later, pioneer is exactly what many consider Amabile. The women’s athletics program at ECC, and at many schools across the country, was in its infancy but had recently received a huge boost from Title IX. Amabile took ECC by storm and, in her two years, became the Kats’ first true female superstar. She not only competed but she competed at the highest level and was duly recognized for her play by being named All-America in both softball and basketball. In so doing, she helped place ECC women’s athletics in the national spotlight and, indirectly, helped propel the program for years to come. Not surprisingly, she was named ECC’s Female Athlete of the Year in 1979 and inducted into the school’s Athletics Hall of Fame in 1992. However Amabile’s athletic fame and her pioneering ways are not solely centered on ECC. She led Frontier to the Section VI Class A softball title in 1975 – the first year the sectional tournament was played – and was one of the area’s first female hockey stars. Following her Hall of Fame career at ECC, she accepted a softball scholarship to Indiana University, one of the first area female athletes to earn a full-ride athletic scholarship to a major university. The seeds of her pitching at Frontier and then ECC took full root at Indiana where she pitched for the Hoosiers in the National Championship series. In fact – another pioneering note! – Amabile competed in the nationals at four levels – junior college, NCAA Division I, the Amateur Softball Association’s A Level and the ASA Major Women’s Fastpitch. She played softball in the Empire State Games from 1986-95 competing for the gold medal in each of those years. Her pioneering days continued in 2001 when the Empire Games offered women’s ice hockey and Amabile, then 40, made the team. She went on to win three gold medals and one silver. In fact, Amabile was one of the first female hockey players in the area, starring for the South Towns Hawks from 1975-81 where the team earned bids to play in three state and one national tournament. Amabile, who’s been inducted into the Frontier High, ECC, WNY Softball and Metro Buffalo ASA halls of fame, continues to share her knowledge of softball and pitching. 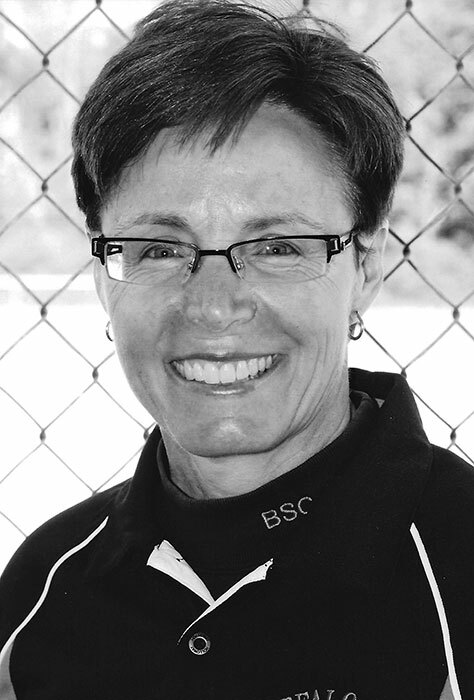 For the past 26 years she has served as pitching coach for Buffalo State’s nationally-recognized softball program, helping lead the Bengals to three conference championships and eight NCAA Tournament appearances. She has also coached hundreds of young pitchers at her clinics over the past 30 years, many of whom have gone on to college careers. Amabile notes with great pride that many of those she has coached (“and their fathers”) have gone on to teach pitching as well.